The castle today is the result of over 900 years of makeovers and changes. In the 20th century, there were extensive changes that have given the interior a modern day look with a country house feel. It is lovely. A piece of history that captured me has ties to my home state of Virginia. In the 18th century Thomas Fairfax, 6th Lord Fairfax, owned not only Leeds Castle but also a quite sizable piece of ground in Virginia...so the sundial clocks show not the local time but the time in Virginia. The last private owner, Olive, Lady Baille, an heiress to an American fortune and daughter of an English lord, bought the castle in 1926 with her second husband and did a total refurbishment (my dream...a makeover for a castle!). She used the finest French architects and designers to create what we see today: an elegant country estate. Filled with antiques from buying trips all over Europe, the castle was used to entertain princes, film stars and politicians. The list of guests ranged from stars like Charlie Chaplain, Noel Coward and David Niven to secret political talks involving Churchill and General Montgomery during World War II. 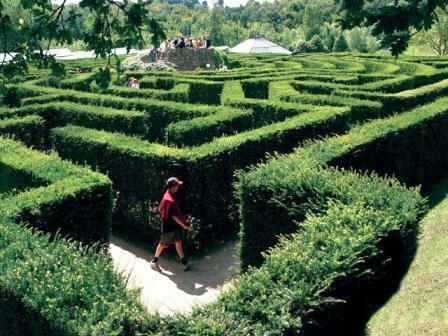 It was known as quite the place with a cinema, swimming pool, exquisite gardens, tennis courts and a collection of animals...and there is also a maze that I managed to conquer after following some children to the center! Today, the castle is owned and operated by a charity established by Lady Baillie. In 1978 the Arab - Israeli peace talks, precursors to the first Camp David Agreement, took place in the castle, as did the Northern Ireland peace talks of 2004 hosted by former Prime Minister, Tony Blair. History is still being made here.